July 24th in Utah we celebrate Pioneer Day. Pioneer Day is a state holiday commemorating the arrival of the first band of Mormon Pioneers to the Salt Lake Valley on July 24th, 1847. 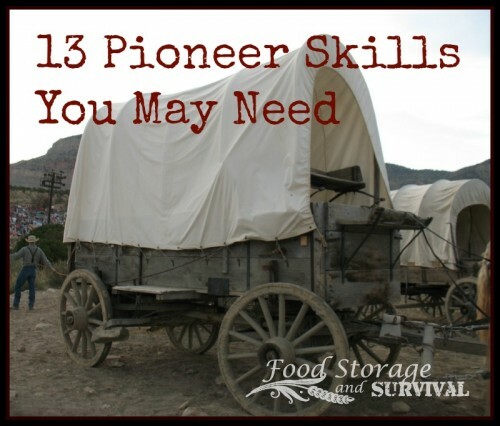 So in honor of those great pioneers of the past, here are thirteen skills that were everyday to them that you may want to learn. Most are skills that will be useful even now, while some may be more necessary in a grid down type situation. 1. Gardening. 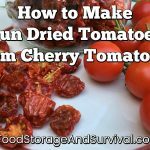 Growing your own vegetables and fruits, knowing soil conditions, how to get water to your plants, extending your harvest season, and common garden pests will be vital to having a continuous food supply. Check out The Forgotten Skills of Self-Sufficiency Used by the Mormon Pioneers for some great old-time gardening tips. 2. Saving seed. The other end of gardening is being able to plant again next year. Saving seed can be kind of intimidating and mysterious, especially for plants like carrots that don’t go to seed in their first growing season. Start with non-hybrid seeds and a reference book like Seed to Seed and practice saving some kind of seed from your next garden. This is definitely a learned skill, but could be vital to a continued food supply. 3. Blacksmithing. Being able to make something useful like a horseshoe, tool, or cooking utensil from scrap metal could come in very handy. This is a skill people will barter for. Blacksmith work does require a good deal of practice and some special equipment, but it’s a skill worth learning and the learning curve is cut a bit if you already know how to weld or do other metal work. 4. Shooting your dinner. Or shooting to protect yourself. Learn to hit something with a bullet and you’ll be better fed and it may even keep you and your family alive. 5. Dressing that game. And I don’t mean sewing little clothes for it. Once the squirrel or rabbit or bird or deer is brought home, how do you make it edible? This skill applies to any livestock you are able to raise as well. You’ll need to know how to clean and prepare the meat for eating. 6. Cooking over a fire. You may have other methods to cook your food available, like a solar oven or barbeque grill, but an open fire is the most primitive and one of the most common means of cooking in a grid down emergency. 7. Making a fire. Try some methods without using matches for an extra challenge. 8. Riding a horse. They make this look easy in the movies, but there is a learning curve involved. A horse is transportation, a pack animal, and a friend. Learning to ride one can get you places when roads are impassable or vehicles aren’t working. 9. Building a home. Or another shelter, or a fence, or something else. Knowing how to use hand tools and simple machines will go a long way if you’re having to rebuild. 10. Making fun with sticks and rocks. Or any available raw materials. Life’s not all about work, right? How many games can you invent with materials you have on hand? We all need some down time, but this will be especially important if you have children around. 11. Knowing and preparing wild edibles. Which plants in your area are safe to eat and what parts of them are edible? A little foraging can add variety to your diet or even sustain life if there’s nothing else to eat. 12. Herbal remedies. If the doctor’s not around, knowing which herbs to use and how to use them to treat common ailments like cough, fever, headache, etc. can be a great blessing to your family or others around that may need the help. An excellent reference for herbs and their uses is the Encyclopedia of Herbal Medicine. 13. Sewing. Patching, fixing tears, altering hems and waistbands, or creating an entire new piece of clothing or bedding could help you stay warm and keep you from running around half naked. Besides their obvious uses to yourself and your family, most of these skills can be used to barter with as well. So while you’re acquiring your preparedness gear, remember to add some skills to your inventory also. If you’re not sure where to learn some of these old time skills, start with your local extension office, reenacting groups, and reference books. And enjoy the learning journey! Not to take anything from your comments or skills of Mormons, but these were common skills of many people all over the world, skills all lost to most of us, lost skills that make us poorer. My parents could do all those things. I certainly cannot. Rocks and sticks? How about peach pits? When I was about 8, my grandmother was visiting. My sister and I were playing jacks with a rubber ball and jacks. We wamted to our grandmother our skills. We wanted her to play with us. She said that when she was little, they had no jacks or balls. Remember, you have one bounce to pick up a number of jacks. They only had peach pits. So, they would toss up a peach pit and scoop other pits from the floor and catch the pit tossed up. I was and still am amazed that she or any child could do that. I had to have the bounce to scoop up my jacks! Do your Pioneer Days have demonstrations of old skills? Those demonstrations fascinate me. I could barely do jacks–I think I’d really stink at peach pits! Whether the Pioneer Days celebrations have any old skill demonstrations really depends on who is in charge. Mostly it is a holiday like the 4th of July with barbeques, camping, etc. Our congregation did a party this year with a little more Pioneer theme activities–horse rides, dutch oven cookoff, and real pioneer era games and toys for the little ones. But no real old skill demonstrations. I love those as well. I saw a demonstration of making corn meal with a steam driven engine. They sold the freshly ground cornmeal in paper bags. Another time, there was the apple press making fresh apple juice we got to sample. I have a friend who made baskets at a demonstration day. I am just truly amazed by the way things were done. A dutch oven! Anyone can “cook over a fire” but it is quite primative. Cooking in a dutch oven over a fire or over coals allows you to cook many more things and cook them better. Interesting comment. I wonder about cooking with a dutch oven over an open fire. I don’t get how you would control that. Now understand I am a mediocre cook with modern tools but I just can’t imagine how you control the heat cooking over a fire. Also, short of what we have now how would people even have cast iron or cookware that would work over a fire. This better never happen or we are in serious trouble. with a dutch oven they have figured out the amount of brickets you need on the top and the bottem to get 350 degrees on the inside. but if you are using wood coals from a fire you would just go for chucks that are similar size and even throughout. my mother and some friends used to go around and do demonstrations of cooking with them. the problem i would have is not having aluminum foil for easy clean up. I agree that dutch oven is a valuable skill (mainly for the great camping food), and I’ll add that milking cows with modern technology is hard enough… doing it by hand is awful! I grew up on a dairy and it was rare to do it by hand, and not a pleasant memory. I loved milking our cow by hand! i wish my kids could have a go at it, but sadly, i don’t know anyone with a “Bessie”! I agree with Claye dutch oven is truly valuable! Well, I’m afraid that in the very near future timeline, we all had better wished we’d learned a majority of the skills you have listed, as I grew up on our small North Central Texas farm, as we were totally self-sufficient in all things regarding our daily needs, but today, it’s flipped from 70% living in the rural areas, and 30% living in the cities, NOW 70% in the metro plexes, and 30% in the rural areas. There will come a time, when, it’s going to flip BACK to the Rural majority, living on one’s own learned skills and merits, for day to day survival!! Get ready folks!! the time is surely coming!! Learn to be self-sufficient, living on your own, without the need of any modern conveniences!! If you don’t, you will reget that you didn’t when the time comes!! Read, practice, store, become aware of living on the land!! God Bless America!!.. :-) You can, if you think you can!! But, skills are necessary to survive!! Harold, you’re right. The majority will live in the country soon because the vast majority of those who live in the cities will die when the collapse comes. I envy your upbringing as those skills will be literally life saving for you. I never learned them and so right now I’m busy reading the stack of books I’ve purchased on these various “self reliance” skills. Hoping to plant some vegetables next year. Medical skills, everything from knowing how to treat someone to bedside manner! Oh, and common sense, this world seems to be lacking common sense sometimes. Not everyone, but the ones that need it most! Regarding the demonstrations, in Salt Lake City they have a whole Historical Park which has old buildings and demonstrations of old time skills. they demonstrate all the things previously mentioned, including medical skills Plus spinning weaving candle making and many more things. The place is called Heritage Park just google it to get more information. Yes, I can do a little bit of all those skills and very good at some of them. I grew up living without electricity or running water and still live without the grid. I am gathering firewood at present for next winter and there is still snow along the back of the house from this winter, lol. Foraging- which I wish I was better at. Looking for the best recipe for Salt rising bread..the kind where the starter has to ferment and stink like bad smelling feet..lol. Basic Geology – to be able to identify shale, flint, coal, salt, sodium, sulfur, etc. I just started my sourdough starter from natural yeast. Im bringing up my skills on different ways of cooking on an open fire, sun oven, dutch oven and preserving. I finally learned to can on my own. I now can all kinds of meats and veggies, pickles and jams and jellies. Im teykng to get better at forging and the processing of animals.